Going into yesterday, the Mets had a six-game Sunday losing streak, made worse by a -69 run differential. Despite a first inning two-run homer by Michael Conforto, the Mets initially looked like they would continue this trend. The bottom half of the first featured a bases-loaded, no-out spot for Chris Flexen to face new Philadelphia Phillie Rhys Hoskins. But, just like we all predicted, Flexen was able to work out of the jam. He induced a groundout and two fly outs, surrendering just one run in the process. This pretty much set the tone for Flexen’s outing. Guys on, work out of the jam. In fact, it wasn’t his only bases loaded, no-out scenario to start an inning. In the fifth, Freddy Galvis, Odubel Herrera, and Rhys Hoskins reached base with Nick Williams coming to the plate. Unlike the first inning, the process to get to out number three was quite unconventional. Flexen was able to work out of the tough spot an odd Odubel Herrera TOOTBLAN, in which he apparently though Galvis would tried for the plate on a shallow fly ball to Conforto in center. Surely an unconventional double play, but a double play nonetheless. So, with runners at the corners and two outs, Flexen was poised (again) to skirt major trouble. Maybe Flexen’s subconscious felt that he deserved more runs than his ledger possessed, but the second pitch to the very next batter was a curveball that scooted away from Travis d’Arnaud and brought home Galvis for the second Philly run of the game. Though Flexen was able to get the batter, Maikel Franco, to groundout and end the inning, his day would be done. All-in-all a weird day. Flexen wasn’t great, but he was able to work out of trouble all day long and keep the Phillies off the board. Basically, Chris Flexen wanted to offer his best Rafael Montero impression before the man, the myth, the legend takes the mound against the Yankees tonight. This is about where the Phillies offense ended on Sunday, as well, as the Mets bullpen nearly worked four perfect frames. The only man to budge, Jerry Blevins, gave up a leadoff double to Cesar Hernandez and walked Rhys Hoskins in the seventh inning. Chasen Bradford, Paul Sewald, and A.J. Ramos put up 1-2-3 innings, which is always nice to see. If Curtis Granderson is trying to play himself into a playoff race, this would be the way do it. The 36-year old lefty was 3-5 with a double and a homerun. The Mets have hinted that they are still interested in trading some of their players, so it will be interesting to see if this performance will spark a Grandy hot-streak. Even if it does, the more interesting aspect might be whether he will get moved. Maybe he has a fit with the Washington Nationals due to the Bryce Harper injury. maybe the renewed AL Wild Card race creates a potential landing spot. Also, I mentioned it earlier, but Michael Conforto hit a dinger. Michael Conforto is good. There is plenty of ways to say it and ways to show it, but the best way is just to call a spade a spade. You don’t need to see his nearly-.968 OPS. You don’t need to see the highlight-reel throws. You don’t need to see the abundant power (though it’s hard to miss). Nope, all you need to know is these tried-and-true words: Michael Conforto is good. The Mets broke a long Sunday losing streak, though at times it got sketchy. Chris Flexen allowed just two runs in five innings, but the outcome was certainly not indicative of the process. 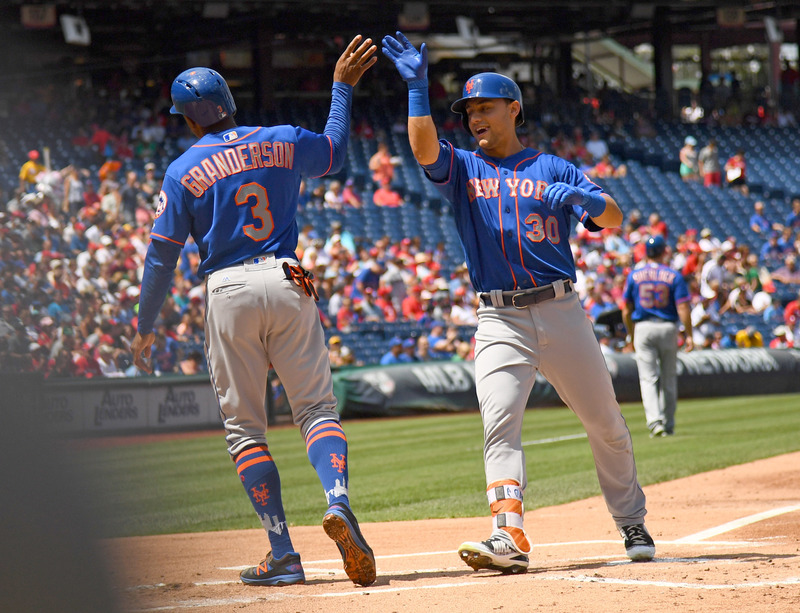 The bullpen looked great, Conforto and Grandy homered, and the Mets took three of four from the Phillies. But, as the kids say, It Is Always Sunnier In Philadelphia. The Subway Series gets underway as the Mets look to play spoiler against their American League counterpart, keeping their two-game losing streak alive. Rafael Montero squares off against Luis Cessa, which is truly a slate for the ages.